I made these for my neighbour who recently had a little boy. Pre heat oven to 160C/gas 4. Line a cupcake tray with paper cases. Cream the butter and sugar until pale and smooth. Add the egg, mixing for a minute or two. Combine the flours in a seperate bowl. Put the milk into a jug and add the vanilla extract to it. Add one-third of the flours to the creamed mixture and beat well. Pour in one-third of the milk and beat again. Repeat these steps until all the flour and milk have been used. Spoon the mixture into the cases, filling them to about two-thirds full. Bake for 25 minutes. Leave in the tin for 10 minutes before transferring to a wire rack to cool completely . Beat the butter, milk, mint extract and half the icing sugar until smooth. Gradually add the remainder of the icing sugar and beat again until the buttercream is smooth and creamy. Add a drop of green colouring and beat thoroughly. Spread evenly over the cupcakes. 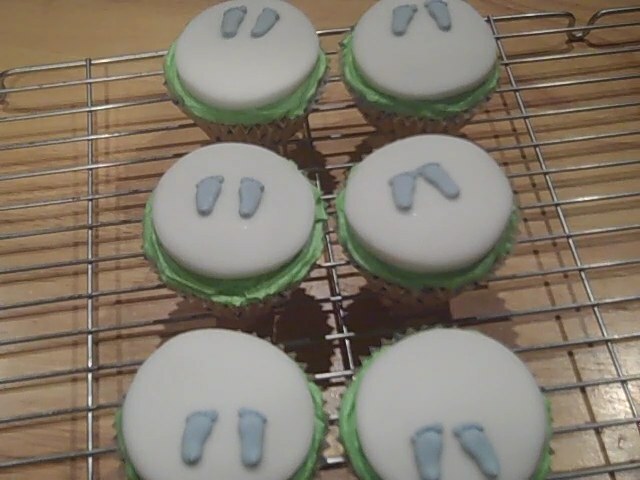 I then used 250g of ready to roll white fondant and using a plain cookie cutter, cut disks just slightly smaller than the top of the cupcakes. Place on top of the buttercream. Then I added the tiny blue feet.